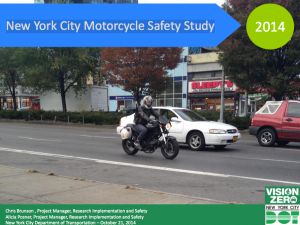 In 2014, the NYMSTF was invited by the NYC DOT to “give input” on a motorcycle safety study. We were very excited to do so, and attended a small meeting in January at 55 Water street. We were excited about this meeting because, to the best of our knowledge, New York City Department of Transportation had never conducted any motorcycle study – about safety, or anything else. The practices of lane sharing and filtering, where motorcycles and scooters are permitted to pass between rows of slow-moving vehicles and to move to the front of queued vehicles at traffic lights, (road and traffic conditions permitting}, is common in most of Europe, the UK and Asia and is legal in California. Laws prohibiting these practices remain throughout the rest of the United States, and the justification seems nebulous. We are inclined to blame ignorance and envy. 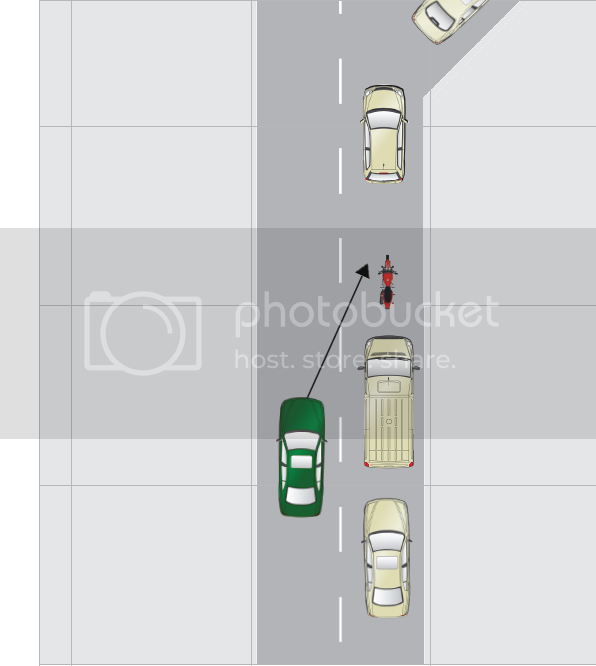 Objections to lane sharing (also called threading, white-lining, filtering and/or lane splitting) are typically attributed to poor confidence in motorists. In 2010 Arizona’s lawmakers passed a bill to legalize lane sharing, and Governor Jan Brewer defied the will of her constituents and vetoed it. The director of the Arizona’s Office of Highway Safety said his biggest concern is that it would create confusion for drivers. Some temporary confusion would have been far preferable to the grisly deaths of four motorcyclists – and the grave injuries of five others – who were run over from behind and dragged 75 yards by an out-of-control garbage truck in Phoenix whose driver was “fishing for papers”. The Hurt Report – long considered the bible of motorcycle safety in the United States, and a foundation upon which much of our motorcycle -related regulation and legislation is built – concluded that lane sharing improves overall motorcycle safety by preventing rear-end collisions. Likewise, the US DOT’s FARS (Fatality Analysis Reporting System) reveals a 30% lower fatality rate for rear-end collisions with motorcyclists in California where lane sharing is legal and commonplace. A recent study in Michigan indicated that almost 9% of serious motorcycle accidents were caused by automobiles colliding with motorcycles from behind. According to the NHTSA, a motorcyclist is 37 percent more likely to die in a crash than a passenger vehicle occupant. Protective gear can only do so much. Lane sharing provides vulnerable motorcyclists an escape route from collisions. Lane sharing is not only safe, it is also a practical solution to urban and highway traffic congestion. Lane sharing allows better utilization of available roadway, does not impede other traffic, and helps promote the use of vehicles which are more space-efficient, more fuel-efficient and “green”, and which don’t need to repeatedly circle the block or idle while double-parked as their pilots hunt for elusive parking spaces. Non-motorcyclists may not realize that a responsible rider using a full-face helmet and protective clothing can be uncomfortably and even dangerously hot in stop and go traffic on a warm summer day. The resulting heat exhaustion leads to foggy thought processes and unsafe vehicle operation. By allowing a motorcycle rider to keep moving and find his or her own breeze, those risks are mitigated. The NYMSTF encourages all motorcyclists to lobby their elected officials to strike laws prohibiting lane sharing and to promote laws and policies which enable motorcyclists to safely filter past stopped and slow traffic. Help the NYMSTF enact lane sharing legislation in New York State! Riding as a passenger (or “pillion”) on a motorcycle can be a great way to enjoy life on two wheels. But there’s a lot you might not know about how to keep it safe, fun, and secure for you and your rider! Riders shift their body in the seat for proper angle and balance. Turning with the handlebars only happens at low speed. At a stop, the rider puts his or her feet down to keep the bike upright. The rider uses hands and feet to shift gears and brake. Tires, exhaust, and engine parts get very hot. Wear a good helmet that fits you snugly without being tight. It should not move around on your head. Wear tough (leather, kevlar) clothing that blocks wind. Even if it’s summer, wind is always cold. Don’t forget ankle‐supporting boots and gloves. No loose, flapping clothing, jewelry, or ponytails. Keep it tucked snugly or do without. Mount when told by grabbing the rider’s shoulder, putting your left foot on the left peg, and swinging your right leg over the bike. Sit down on the passenger seat and get centered. Give the “Ok” only when ready. The rider may have you hug their waist, put your hands in their pockets, or hold a strap to stay secure. You and the rider should be “one unit” – stay with their body: don’t lean more than them, but don’t resist leaning. In turns, look over the rider’s inside shoulder in the direction of the turn. Keep your feet & weight on the pegs at all times, even when stopped. Try to keep your back upright when braking and avoid knocking helmets together. Ask before you move: wait for the rider’s “Ok” before you get on or dismount, change position, or grip. Plan a “shoulder tap” signal if you need to stop or are uncomfortable. Ask what route you’ll be taking, at what speeds, and how often you’ll stop. You have a right to know! Smile, wave to children and onlookers, and show the world you’re having a good time! Ever wonder why there is seething antipathy towards motorcyclists in New York City? Why are responsible riders shouted down at Community Board meetings by residents claiming we’re all a bunch of noisemaking, lawbreaking hooligans? Why do you get a sideways glance when you’re locking up your full-face helmet to your 50 MPG commuting bike? Sadly, a number of riders seem to be intent on creating the most hostile environment for two-wheelers by offering themselves as the worst possible examples of motorcycling. And as the “squeaky wheels”, their behavior gets the attention while the overwhelming majority of responsible riders are ignored. On September 4 2011, “Hollywood Stuntz” organized a motorcycle riot at the Gateway Mall in Brooklyn. They incited hundreds of riders to meet and proceed to endanger the lives of citizens and police officers – not to mention their own – in a terrible display of squidliness. They rode recklessly throughout the city, ignored traffic signals and swerved through the streets, up sidewalks – many with minimal gear, illegal modifications and obscured or missing license plates. If you were on the ride or involved in promoting it, know that it is because of you that motorcyclists are regarded so poorly in this city. You are doing nothing but ruining motorcycling for the rest of us.